Matt Deighton is an entrepreneur whose ventures have included a popular Texas restaurant and, more recently, the manufacture of a boutique condiment called Duck Salt, which he markets direct to fundraising groups across the USA. After his home was destroyed in the Greensburg, Kansas EF5 tornado in May of 2007, he began work as the official Volunteer Coordinator during the clean up and rebuilding, directing the efforts of some 14,000 volunteers who flocked to Greensburg to help. 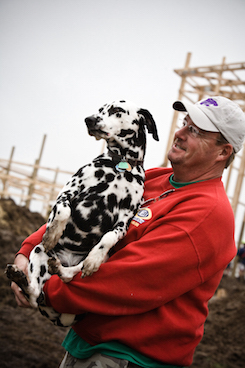 Over the past seven years he and his Dalmation, Molly, (who’d become an iconic Greensburg resident) continued working voluntarily, latterly spending much of their time devoting their energies to meeting children in areas rebuilding after disasters, and distributing Stars of HOPE for the New York Says Thank You Foundation - work that carried the pair of them to disasters in Missouri, Minnesota, Arkansas, Iowa, Kansas, Texas, Georgia, New York, Newtown, Connecticut, as far afield as Japan, and, most recently, which has taken Matt to Oklahoma, following the massive tornado in 2013. It even took them both onto the red carpet at New York’s Tribeca Film Festival in 2010. Though Molly passed away in December 2013, aged 14, she is already immortalized in Matt’s children’s book about the Greensburg disaster, Molly and the Tornado.